Without being intrinsically lucky, some people spontaneously do things that make good things happen to them. 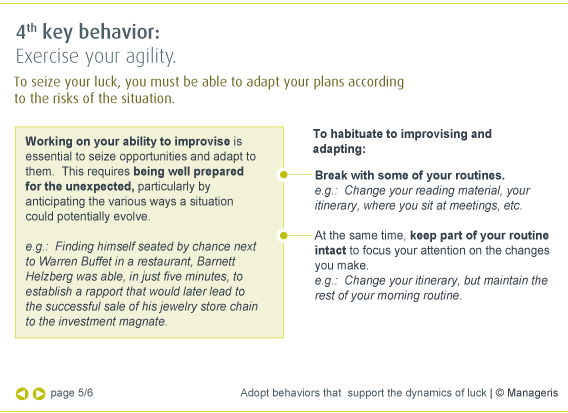 So what behaviors are conducive to luck, and how to implement them to develop what is actually a real skill? Though the decisive role of luck in most great successes is anathema to many, given the qualities and efforts deployed, the experts agree that luck plays an important part in both personal achievements and strategic successes! Everyone knows today that the Post-It was born from an error; a failed effort to produce a super-strong glue gave rise to the idea of repositionable adhesive memo paper. What is less well known, however, is the fact that this is far from being the only element of luck that came into play. The fluorescent yellow color is also a key factor in the phenomenal success of the “Post-It.” However, this was not a deliberate choice, but a mere stroke of good fortune. To conduct large-scale tests, 3M engineers had access to surplus paper no one else wanted, because of its gaudy color. Reactions were unanimous: “What a brilliant idea to have chosen a color so easy to spot!” Thus, one of greatest business successes of the twentieth century is the result of a fortunate combination of circumstances, upon which 3M was able to repeatedly capitalize. minute to replace Margherita Carosio in Bellini’s “the Puritans” in 1949 that her career took a decisive turn. As luck would have it, playing this role enabled Callas to discover her true calling, the romantic Italian Bel Canto, in which she subsequently excelled. So should we simply give into fate? Actually, social psychology studies show that the propensity to identify and seize opportunities varies widely from person to person. Some people indeed seem lucky. 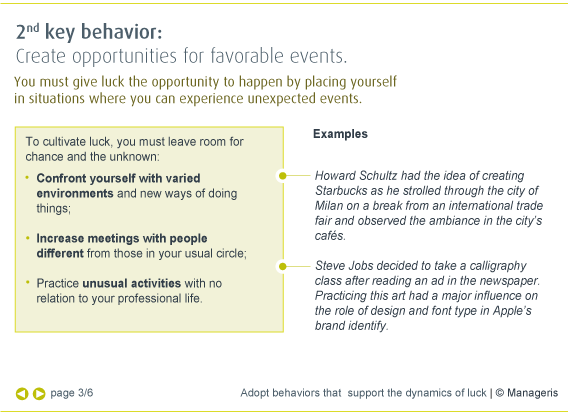 Yet, these individuals are in fact those who adopt the mindset and behaviors that make lucky events more likely to occur. How can you develop your luckiness? The analyzed publications propose invaluable suggestions to do this. Luck doesn’t always happen by chance. 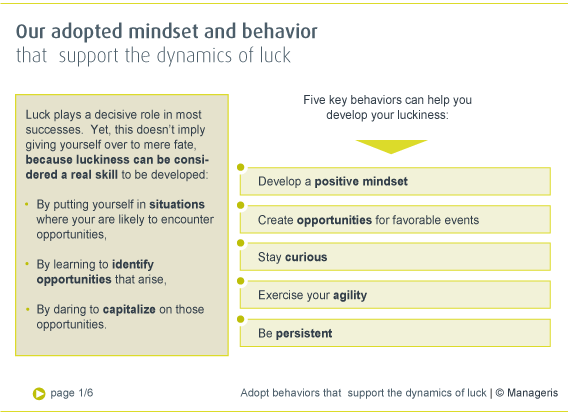 What are the key competencies to develop to attract luck and good fortune? Hard work is no longer enough to succeed in a shifting environment. How to stack all the odds in your favor? Luck is not just a matter of fate. 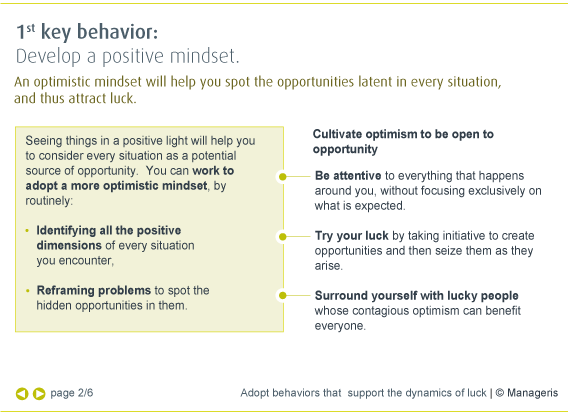 How to foster the behaviors that make luck happen? How and why to cultivate optimism? Advice from someone who has developed a passion for networking. Learn how to capitalize on your luck. Three character traits that make it possible to increase the likelihood of luck..